I want to be clear: this is not a salvo in the war on Christmas. To the contrary, as a Jew I appreciate the fact that at this time of year you offer Hanukkah-related food and gifts. However, in the spirit of holiday giving, I’m sharing some advice: in future years, you might want to do a little research before you order and stock your shelves. I notice that this year, in addition to Hanukkah candles for the menorah (nine-branched Hanukkah candelabra), gelt (chocolate coins) and dreidels (spinning tops), your holiday display includes “Jewish” products like matzo and matzo meal. Now, I know traditional Hanukkah pleasures, like jelly donuts and potato latkes are not exactly aligned with your healthy lifestyle values, but matzo? Have you ever tried that stuff? Hanukkah is an eight-day celebration dedicated to the miracle of one day’s worth of oil that lasted for eight days – hence our excuse to eat anything deep-fried. On the other hand, Passover is a springtime holiday that tells the story of Moses leading the Israelite people out of slavery in Egypt to their new home in the Promised Land. That little jaunt, which should have taken about 11 days, took 40 years. To commemorate the fact that the Israelites fled Egypt in such a hurry that they had no time to rise their bread, we eat unleavened bread, i.e. matzo, made of just flour and water – much like a very bland, very dry cracker for 10 days. It’s not something you’d want to repeat more than once a year. What’s the difference between matzo and cardboard? - Cardboard doesn’t leave crumbs in the rug! Get the point? Nobody in his or her right mind would buy matzo at Hanukkah. Sellling matzo at Hanukkah (even gluten free!) is like selling Easter bunnies at Christmas – only without the chocolate. That being said, I am grateful that I can just head over to my local Whole Foods to stock up on Jewish items at this time of year. 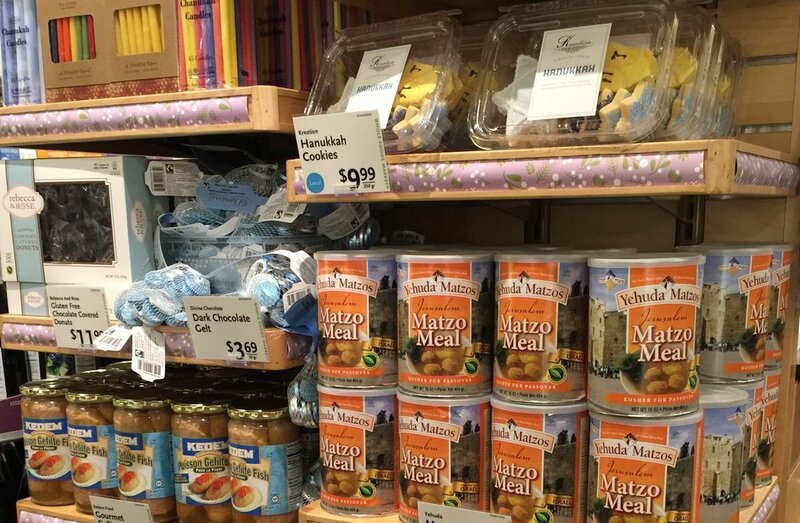 I can remember a time in the not-so-distant past that I felt like one my ancestors wandering the desert as I madly drove from supermarket to super market all over Vancouver in search of Shabbat candles, Hanukkah gelt or yes, even matzo. Wait. On second thought, maybe I will stock up while I can.